This listing is for 1 Handmade Milk & Cookies Candle. 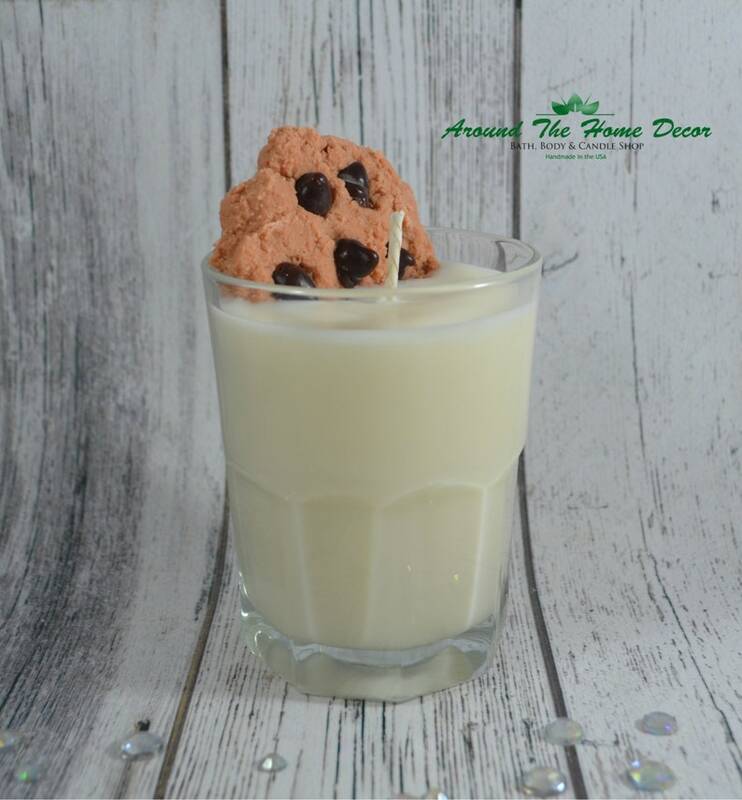 This candle is hand poured in an iconic milk glass and decorated with a delicious looking chocolate chip cookie made by hand with all natural vegan soy wax. It looks real and smells good enough to eat! This candle is Scented with our Sugar Cookies fragrance. This candle is perfect for a housewarming gift, Teacher's Gift, or Holiday Decor for Christmas time! Santa loves his milk & cookies too! You can choose to have this candle personalized with any name for a new homeowner, Teacher, or choose the "For Santa" option to give your Christmas Decor a special touch. If you choose the name customization, please be sure to make a note to seller during checkout with the name you want on your candle. Apricot 9 oz. All Natural Vegan Soy Cotton or Crackling Wooden Wick Candle by ATHDecor. Dye Free. Buttercream 9 oz. All Natural Vegan Soy Cotton or Crackling Wooden Wick Candle by ATHDecor. Dye Free. Chardonnay 9 oz. All Natural Vegan Soy Cotton or Crackling Wooden Wick Candle by ATHDecor. Dye Free. Dreamsicle 9 oz. All Natural Vegan Soy Cotton or Crackling Wooden Wick Candle by ATHDecor. Dye Free. Midnight Toast 9 oz. All Natural Vegan Soy Cotton or Crackling Wooden Wick Candle by ATHDecor. Dye Free. Lavender 9 oz. All Natural Vegan Soy Cotton or Crackling Wooden Wick Candle by ATHDecor. Dye Free. Christmas Tree 9 oz. All Natural Vegan Soy Cotton or Crackling Wooden Wick Candle by ATHDecor. Dye Free. Rose 9 oz. All Natural Vegan Soy Cotton or Crackling Wooden Wick Candle by ATHDecor. Dye Free. Jolly Mistletoe 9 oz. All Natural Vegan Soy Cotton or Crackling Wooden Wick Candle by ATHDecor. Dye Free. Cannoli 9 oz. All Natural Vegan Soy Cotton or Crackling Wooden Wick Candle by ATHDecor. Dye Free. Strawberry Shortcake 9 oz. All Natural Vegan Soy Cotton or Crackling Wooden Wick Candle by ATHDecor. Dye Free. Cake 9 oz. All Natural Vegan Soy Cotton or Crackling Wooden Wick Candle by ATHDecor. Dye Free. Chocolate Fudge 9 oz. All Natural Vegan Soy Cotton or Crackling Wooden Wick Candle by ATHDecor. Dye Free.